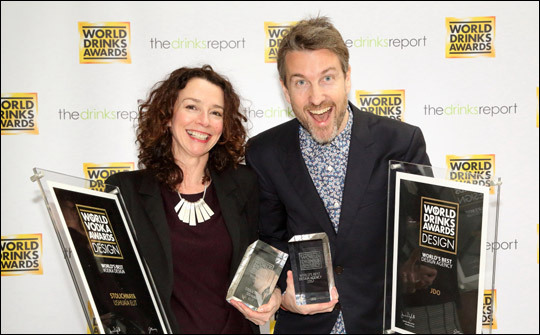 The World’s Drinks Awards 2017 were presented on Thursday, 30 March 2017 by Felicity Murray, editor and founder of TheDrinksReport.com, and Richard Watling, master of The Worshipful Company of Distillers, at the Waldorf Hilton, London. Selected by an international panel of experts over three rounds of judging, Murray says: "The judges of both the Taste and Design categories were extremely discerning. All those who have won an award can be justifiably proud." "A stunning design, simple yet luxurious. Great combination of primary and secondary design. A superbly crafted and characterful presentation case. The bottle itself is beautifully designed with great attention to detail. The pear drop shoape sitting in a spiral stand certainly adds a unique element to this very special release from Highland Park." "This design agency consistently produces eye-catching, story-telling and highly detailed illustrative work on cartons and labels across a huge range of different whisky expressions, making each unique in its message and style." "A fresh, contemporary deisng incorporating classic elements." "This superbly crafted and totally unique presentation case and bottle design is perfect for the luxury Travel Retail market. A stunning design, simple yet luxurious." "The beautiful pear-shaped bottle, poised in a spiral coil and set in a luxurious cabinet is truly unique. Stunning casing with a simple yet luxurious design." "An outstanding 360 degree design with every element carefully considered. Huge complexity in label application. A lot going on, but working well together." "Very elegant design incorporating the traditional Glenfiddich bottle shape." "A refreshing transformation in design, giving the impression of a bigger brand. Lovely graphics on the label, complete with the outer packaging for the unusial shape bottle." "A little bottle that stands out! Quite a quirky brand personality with a simple confident design, that communicates craft." "Feminine with finely detailed illustration and pattern combining raised gloss print areas along with matt and pearlescent finishes. This is encased in a softly padded and neatly printed lightweight wooden case, tied with braid. Pretty and delicate." "A very elegant, fantastic design with the wooden outer packaging and manual lock. Together with the heavy, classic glass bottle, a well-designed package."